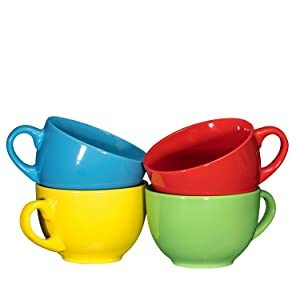 These colorful bold mugs will make a great addition to your kitchen. They can be used for anything from coffee to soup due to their 24 oz capacity. Hot cocoa in the winter, ice cream in the summer, anything goes! They are dishwasher safe and microwave safe. Made with high quality ceramic and stain resistant. Stocking stuffer, dorm essentials, apartment, housewarming, you name it! 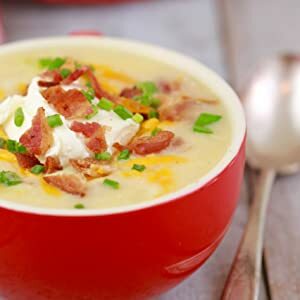 Learn how to make my Microwave Potato Soup loaded with delicious ingredients like bacon, cheese and scallions. It's a Mug Meal in just minutes! Into the potatoes stir in the bacon, cheese and onions and cornflour. The cornflour will thicken your soup. Place in the microwave and cook for 2 1/2 - 3 minutes or until it thickens and all of your ingredients have heated through. (Cooking time is based on my 1200W microwave so your timing might vary) Always keep a close eye on your mug while in the microwave so it doesn’t over flow or over cook. We started in 2014 with a set of Bruntmor iced teaspoons, and now we have an entire catalog of products from French presses to a 21-piece enameled cast iron cookware set. 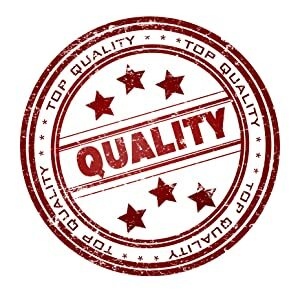 We facilitate tons of research to ensure that everything is top quality. A standout category is our cast iron products. We work with the best factories and make sure you get exactly what you asked for. With several high ranking and five-star items, we hope you can see how much we care about our products.